Like I said before, over Labor Day weekend we got a lot of projects crossed off the list. It felt good. In fact, it felt so good that I think I might have become a little over confident in my abilities. We made a lot of changes to the dining room and the amazing result (which I will share next week) left me wanting to create a new centerpiece for the table. Can you see where this is going? 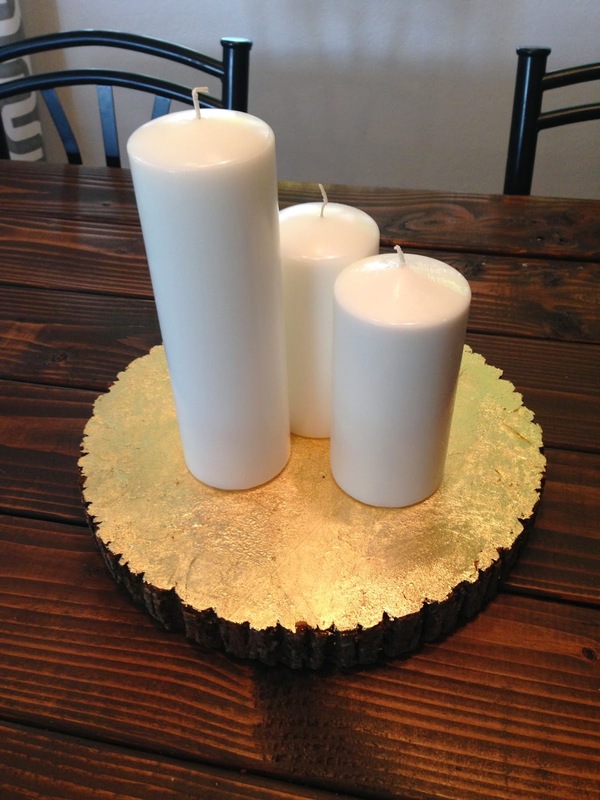 One of the latest trends for home decor is gold. Seriously, gold is making a huge comeback. Fixtures, decor, hardware, you name it and it probably looks better in gold. 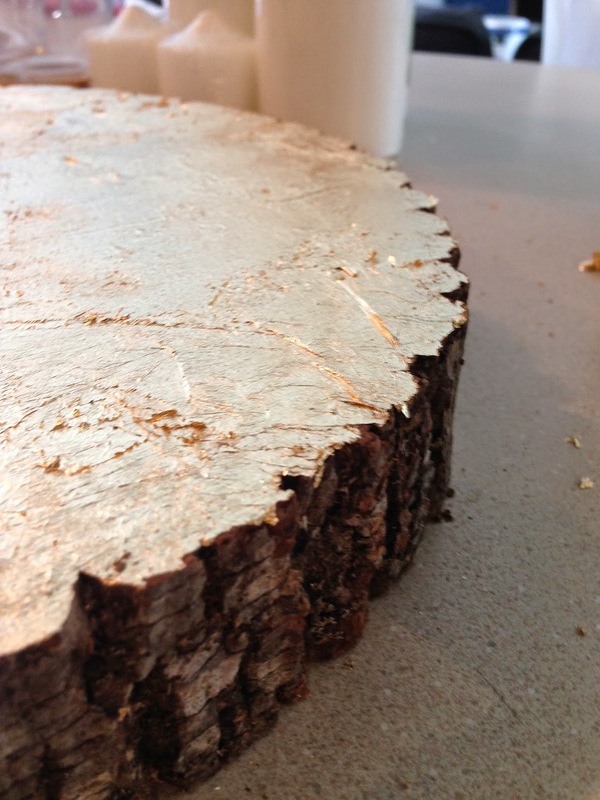 I've been seeing a lot of Pinterest projects with gold leafing and thought to myself, "How hard could this be?" I'm pretty crafty. It's pretty much like paper maché right? No it is not like paper maché. The little candle holders were ones that I already had. I thought I would Gold Leaf the bottom of those while I was at it, but then quickly changed my mind once this project was well underway. The instructions on the back of the Gold Leaf are pretty simple. 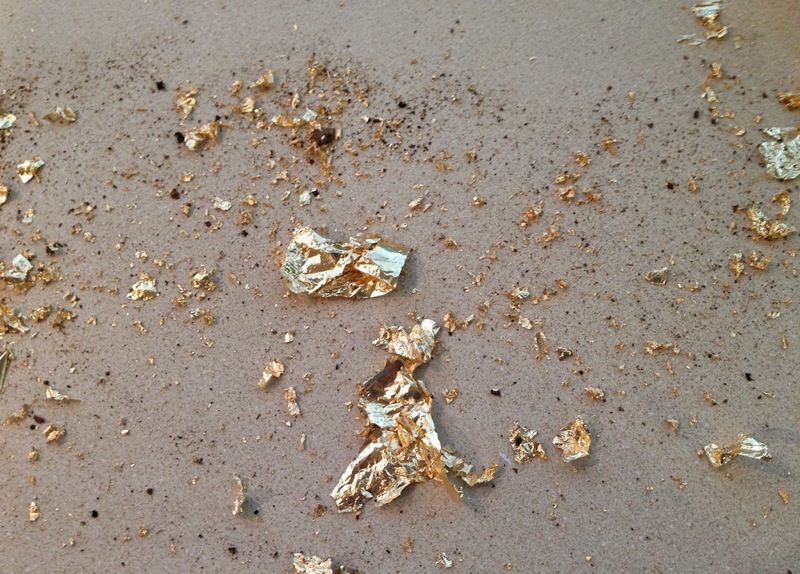 Clean your work area, apply a little bit of adhesive and then gently apply the Gold Leaf paper, smooth out said paper, continue until area is finished and then seal. 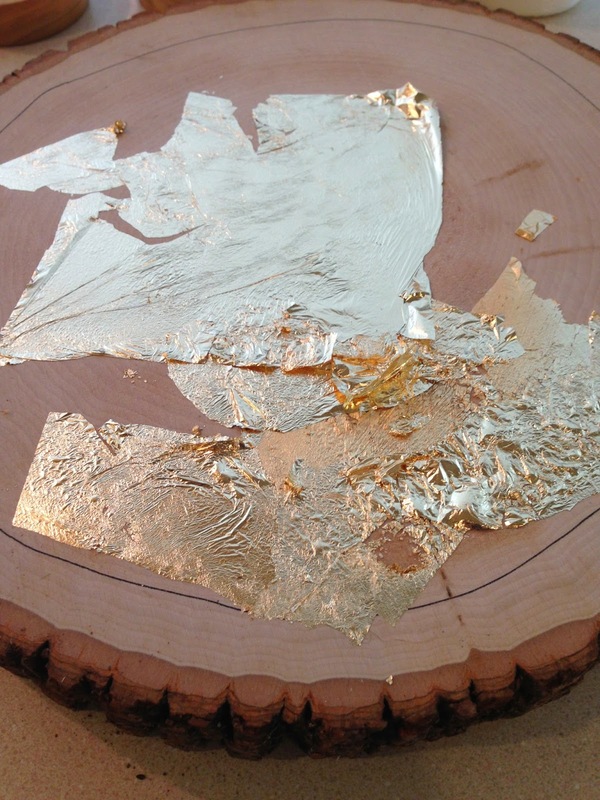 I drew a circle inside the wood round as a guide to where my Gold Leaf should end and then began applying the adhesive in small sections. This is where things started to go wrong. To say that the paper is "thin" does not do it justice. 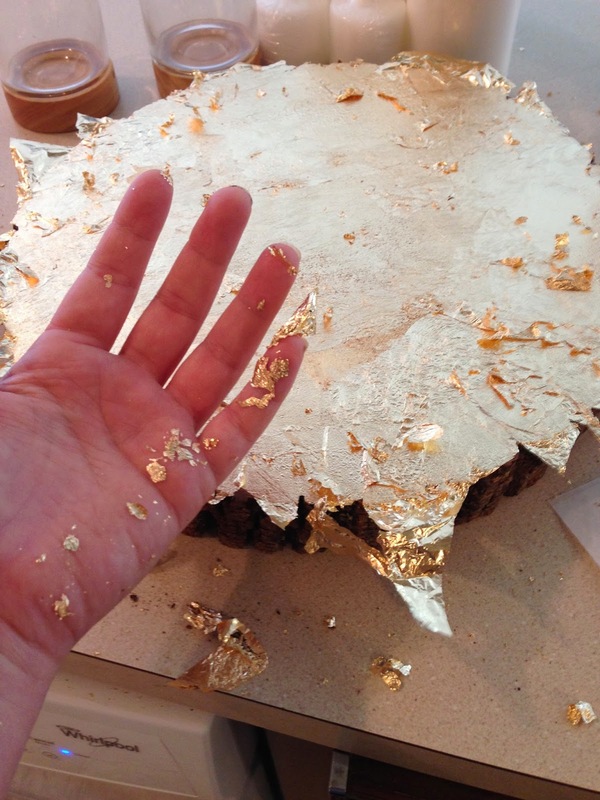 Gold Leaf paper is as light as a feather and half as thick of a regular piece of paper. As soon as I got it out of the packaging my fumbling paws immediately began tearing it. I slapped it down on the glue as fast as I could and tried to smooth it out, but that left me with tiny flecks of Gold Leaf ALL OVER THE DAMN PLACE. I not only managed to get it all over myself and the kitchen counter, but in the dishwasher, the floor, on the dog and one of the cats. I also realized that trying to keep the Gold Leaf within the line I had drawn on the wood round was practically impossible and wound up just sticking it all over the top. 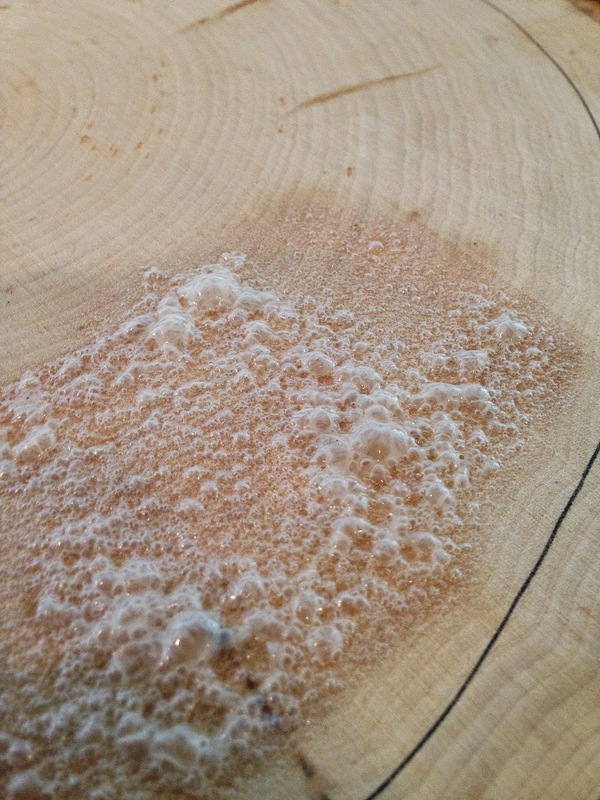 Eventually I was able to get a few layers on and smooth them out the best I could. I sprayed some sealer on it and then spent the next five hours cleaning up flecks of gold. After it dried I plopped some candles on it and called it good. This project did not turn out how I thought it would. At all. It's definitely different and because I'm lazy it will stay on my table for while. Maybe I'll add some little white pumpkins for Fall decor. 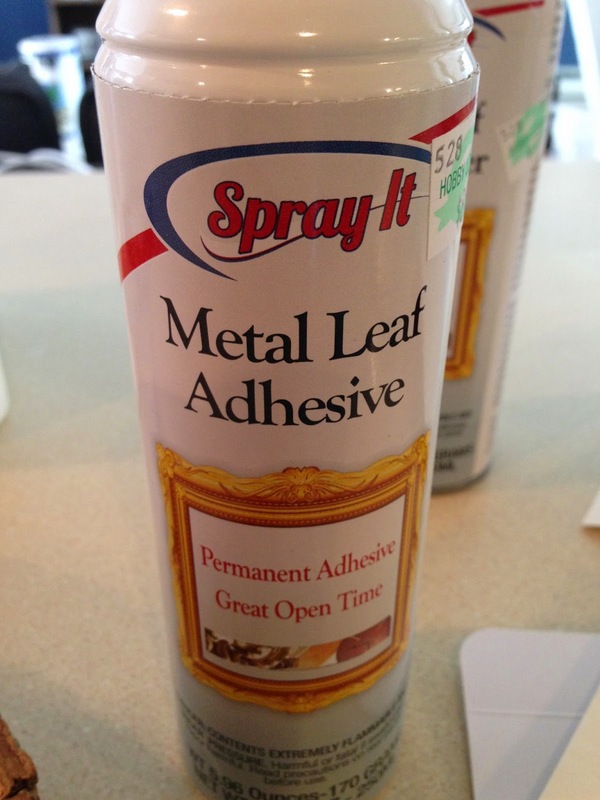 Either way, I really don't see Gold Leafing in my near future. No thank you. Has anyone else had any luck with this stuff?